Saturday we attended a course entitled “Beekeeping in Northern Climates” at the University of Minnesota. Dr. Marla Spivak and scientist Gary Reuter from the Department of Entomology taught the course. There were about 160 people in attendance (the interest in beekeeping has dramatically spiked in recent years). It was a very informative course and we came away feeling like we learned several ways to improve our beekeeping this year. Below are a few of the highlights. After the loss of our first bee colony last winter (described here), some of the most pertinent information for us was on successfully wintering a hive in our cold Minnesota climate. The first tip that we learned was that a larger bee population would increase the odds of the colony to survive through the winter. 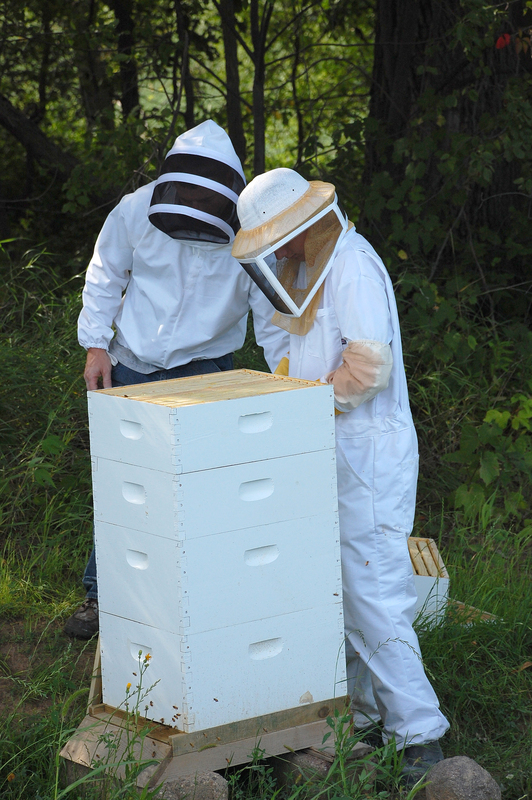 Wintering with 2 brood chambers in Minnesota is possible, but the UofMn recommends the use of 3 brood chambers to increase the colony population and honey stores. We will definitely increase from 2 to 3 brood chambers to improve our odds next winter. Bottom two boxes are the larger brood chambers, and the smaller boxes are honey supers. We will have them fill three brood chambers before we add honey supers this year..
Jesse believes that moisture build-up due to insufficient ventilation was the primary cause of the colony failure this winter. The dead bees were black and wet when we opened the hive in February. There were also honey stores still remaining in the hive. We learned that the UofMn recommends drilling a 1 inch diameter hole 3 inches from the bottom edge of the hive body. The hole is normally plugged, but in the winter the hole in the top brood chamber should be left open for ventilation. Another recommended practice is to place a piece of “buffalo board” over the inner cover to help draw the moisture out of the hive, and one flap of the hive protector should be tucked along the hive to create more space for air flow. It was very interesting and refreshing to learn that the UofMn is promoting that beekeepers move away from using chemicals and antibiotics in their operations, except as a last resort. Dr. Spivak believes that over-treatment of the bees has led to poor natural resistance and the bacteria, viruses, and pests have become resistant to these treatments. For example, Terramycin is a common antibiotic that research has shown is becoming ineffective at treating American Foulbrood (AFB). Instead, the UofMn is advocating that better results can be achieved by improved management techniques and using bees bred to exhibit hygienic behavior. Some of the management techniques we will follow after attending this class are: (1) replacing brood combs every 5 years; (2) shake, requeen, and burn comb if AFB is detected; (3) order MN hygienic queens next year; (4) use the 2 hive horizontal rotating method to keep our colonies strong and young queens; and (5) buy Varroa mite traps for our hives to improve colony health. Our bee supplier called today to tell us our packages of bees will be arriving some time this week. After attending this class, we are even more excited to start our second season of beekeeping!